Hunting big game animals in general can be a frustrating, sometimes an exhausting battle of patience, wits, and endurance. 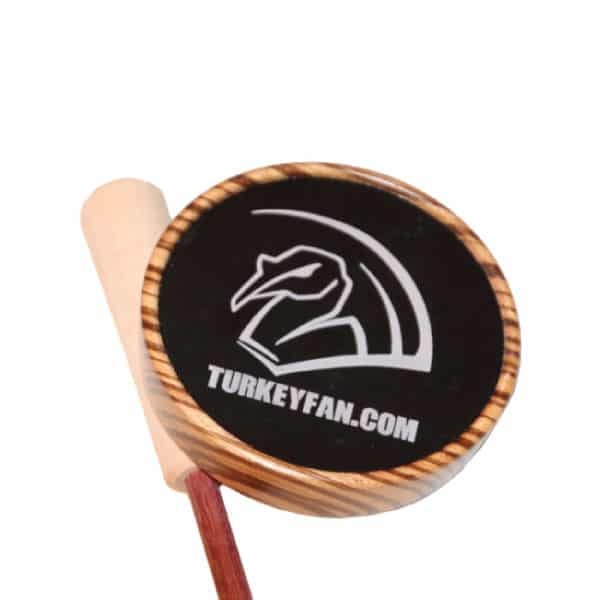 Regardless if you hunt on the weekend, or are lucky enough to spend your weekdays in a field. 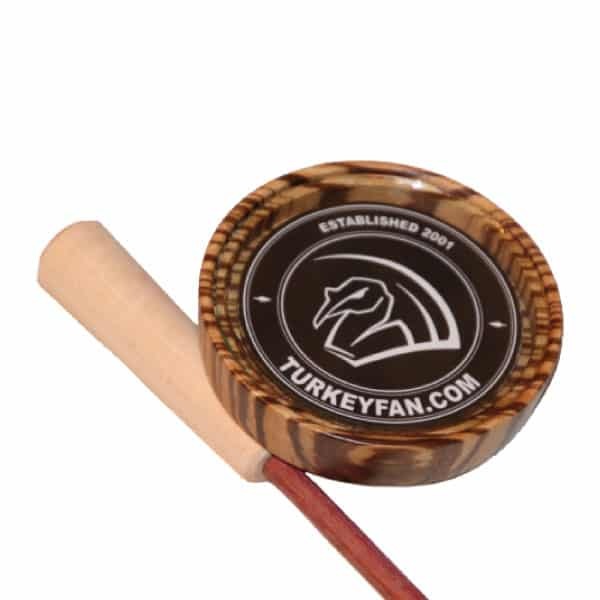 Most of us share that same passion and drive to be successful in bringing home a trophy. 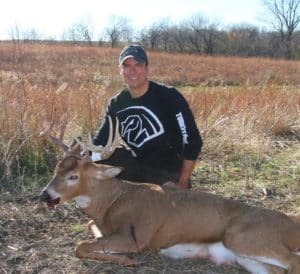 Whether it’s a whitetail, elk, sheep, or any other big game animal, we as hunters are blessed to put so much time and effort into our passion of hunting each and every year. I believe most hunters are stewards of conservation, and do their best to harvest older, more mature animals. The goals and meanings of success are different for everyone. Some are after the meat, for some any animal will do, and others, which I think go for most, set their sights on big horns and antlers. Albeit not the priority for all, but a definite driving force for many, myself included. Between studying maps, managing land, tracking movement habits etc. It’s all part of learning and understanding so we can outsmart and give ourselves the advantage to catch up with and get close to what it is we’re pursuing. Singling out a specific animal is another discipline all together. An obsession is required to get through the ups and downs, and the almost inevitable conclusion of failure you’re going to find when you’ve chosen an animal that is old and wise for a reason. It’s decisive and methodical in its every move, to the point they are almost un-killable or what I like to call ghosts. This is what I’ve found myself caught up in without even planning it. The quest for a particular whitetail. The One. To set your sites on something and nothing else, takes a certain mind set. First and foremost the hardest part for me is to pass on other animal’s I would most certainly have taken given the chance in another setting. It’s inevitable, the minute you choose it’s the one or nothing at all, you seem to get more opportunities at others than ever before. Donnie Vincent once said, “Make no mistake about it, this is a blood sport, and we’re here to kill him” And that’s exactly what I planned to do. And so begins the Story of the One. 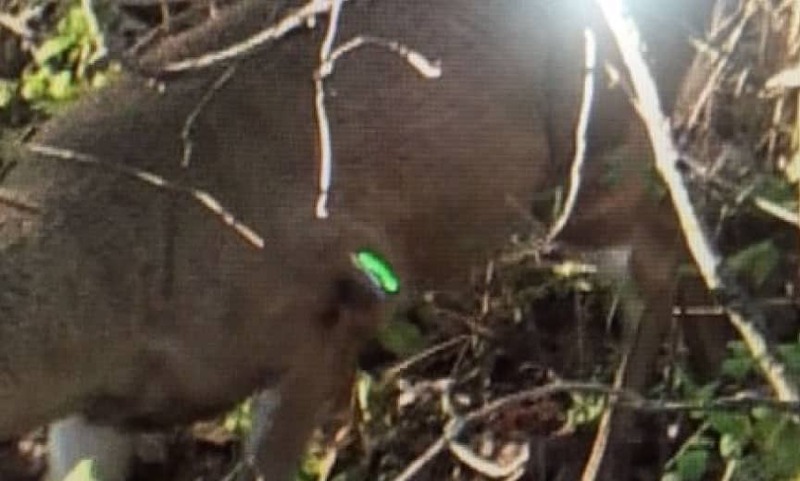 It began in the summer of 2014 when checking trail cameras on a farm I’ve hunted for many years. 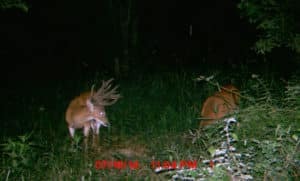 With no real excitement or expectations I put out a few cameras like every year to see what I had to look forward to in the upcoming season. This year however was different. We had just endured a horrible year to EHD and lost well over half of the deer population in our area. 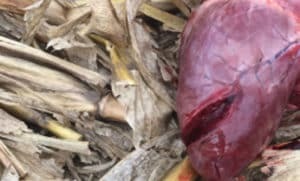 I was sick and defeated after finding dead deer after dead deer in 2013. Being mostly bucks, my entire hit list was now gone with no real hopes of having good hunting again for years to come. 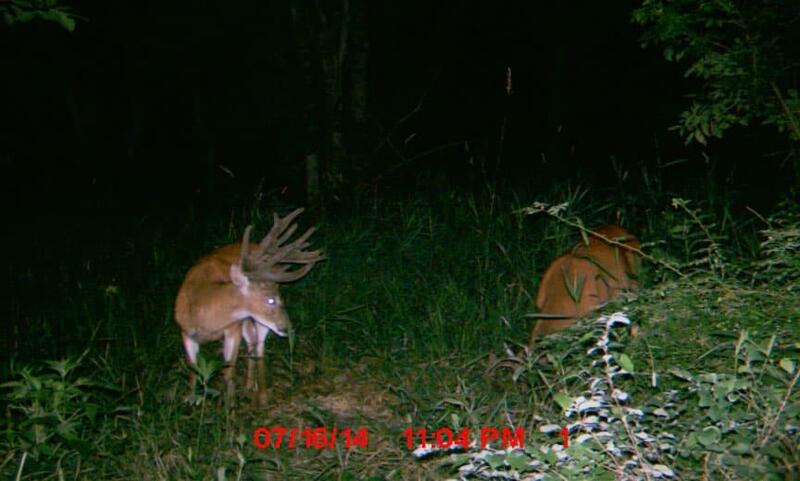 So with that said you can believe my surprise when two mega bucks showed up on camera the summer of 2014. First to make his debut was a buck I’d never laid eyes on before. He was massive, he had character and he was big. I would like to say he got a name right there and then but a few pictures later something else grabbed my attention and my focus immediately turned to the now known Big 12. My sights were set, my mind made up, and the game started for the Big 12, putting the massive non typical on the back burner. As fate would have it, I wasn’t meant to kill the Big 12. Instead the opportunity went to a great friend of mine and made a story of his own which you can check out here. 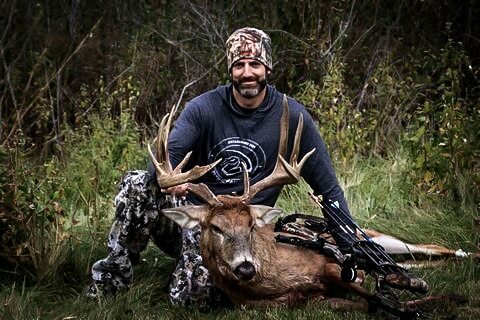 I couldn’t have been happier for him, and after all I still had the non-typical to hunt. How ever the doubt and frustration set in pretty fast with the non-typical. The last picture I had gotten of him was in early August. I hunted through the rut with a few opportunities at other deer. A tree limb sent me home sulking one evening, but inevitably closed out the year without laying eyes on him. 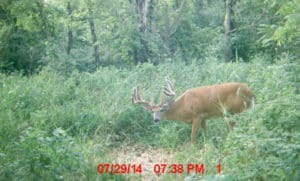 During a conversation about shed hunting I was reminded that I might get lucky and find his sheds. I believe my response at the time went something like. “Yeah right.. That deer is gone, he has left the building.” A jokingly reply back about Elvis has left the building, and he was forever named Elvis. Caught up in life and all kinds of other endeavors, Elvis never entered my mind again. With no sheds found. I began the 2015 season by taking my oldest son youth hunting. I hung some tree stands and ran a few cameras with again no real excitement or expectations. Until October 28th when I met my video producer at the farm to film some B-roll commercial stuff for the TurkeyFan, Elvis decided to show himself in person for the first time ever. 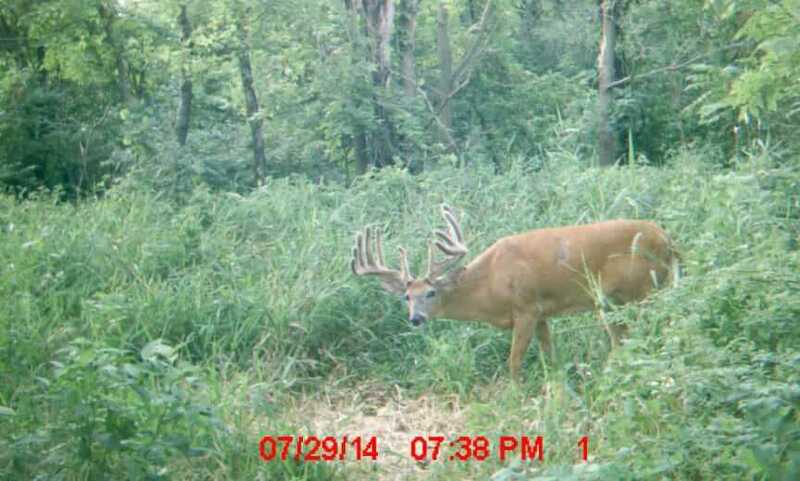 He came strolling out of a patch of CRP into a picked bean field about 100yds away. The second I put my binoculars up to get a better look I knew exactly who I was looking at. He only showed himself for a brief moment in time, but that’s all it took to light the fire in me that had been missing for the past few years. Elvis had grown, not just in age but in size, and with him showing himself in broad daylight, I knew I had a chance. From that instance, I started preparing, and coming up with a game plan for the days to come that I would use to hunt him. I started hunting, and making all day sits Friday, November 6th, one of my favorite days of the year to be in a tree stand. Being the first day of sitting all day, I wasn’t fully prepared, and found myself hungry around noon with nothing packed to eat. With little movement that morning, it didn’t take too much convincing to get me out of the stand to run to town. Murphy’s Law, as soon as I pulled back into the farm at 1:30, who do I see working his way directly to my tree stand? Elvis, for the second time in a week, I’m laying eyes on him in the day light, which was great, but the fact I had just missed him under my stand was like a punch to the gut. I quickly got over it after realizing he had approached my stand from straight down wind. If I had been in the tree he no doubt would have winded me, learned a valuable lesson, and made himself even harder to kill. So what seemed to be a horrible mistake on my part ended up being a blessing. This sighting, watching him walk under my stand and work a scrape, almost mocking me was what tripped the trigger for me to make the decision that it was him or nothing no matter what. He was going to be the one. I knew that meant I would probably eat tag soup, but I had that fire and drive back and felt like he was worthy of the test. After watching him walk off down the ravine, I backed out and headed home to spend the rest of the afternoon looking at Google earth and devising an attack plan for the weekend. At this point at least for me this is the toughest part. Making decisions and sticking with them. It becomes a game of what ifs, and maybes. I finally settled on a plan for the next morning and scratched any ideas further than that because I simply couldn’t stop questioning my own thoughts. I climbed into a giant cotton wood tree that morning and continued to question myself if I had made the right decision clear up to 7:45 when out of my surprise Elvis showed up and on a fast pace. I had a clear lane right past me at 15 yards and another out at 40 yards with thick nasty brush in between. As he closed fast I did my best to get ready for a quick encounter. Like a lot of giant bucks though, he thought he was more rabbit than deer, and chose the thickest, hardest route for him to walk through. All I could do was watch him through my peep while at full draw as he walked by at 30 yds. I didn’t have a clean shot until he popped out at the end at 60 yards which is too far for me. So instead of taking a risky shot, I put down my bow and picked up my camera. I gave him a couple grunts and a snort wheeze for good measure but like a king of his craft, he knew better, and merely gave a brief look back only to smile and give me the look of yeah right! That we all know so well. So far I thought I was doing pretty well. I had partially figured him out twice, and learned more about him and his habits while doing so. This made my decision making a bit more decisive in the days to come, only to be let down day after day of not seeing him. I hunted all day everyday clear up to Friday the 13th. At this point I had pretty much driven myself crazy, lying awake at night wondering where he was and what he was doing. I was also getting to the end of my days I could hunt him as hard as I was. Thursday night I was talking to Rick and needing to take some pressure off so we decided to hunt together on Friday morning and take the camera equipment. This may not have relinquished the pressure completely, but momentarily it changed the vibe and made things a bit more light hearted and fun. We both sat contently feeling satisfied that we had been successful to that point. Anything else we felt would just be icing on the cake. Around 9:30 I remember hearing a stick break behind me where Rick’s deer laid, as I looked over my shoulder I saw a deer walking straight away. I remember my first thought was that Rick’s deer had gotten up and was walking away. That thought didn’t last long. As soon as the deer turned his head it was like the world paused and that really loud dramatic sound you hear at the movie theater from Pixar sounded off. Not really but I’m pretty sure that’s what I heard in my head. So there we were. One deer on the ground, Elvis at 30yds and walking straight away. I’m still not sure how he sneaked in on us, but that was just details at that point. It never even dawned on me that there was a good chance I wouldn’t get a shot since apparently he didn’t like the dead deer on the ground, and it had turned him around now heading away from us. Typically when I see a shooter animal my first thoughts are the probability of it actually working out and the animal giving me that shot. Not this time, I just knew it was about to happen. The muscle reflex kicked in and I went straight into auto -pilot mode or what Rick calls it Auto-archer mode. Elvis read the script and followed it that morning. 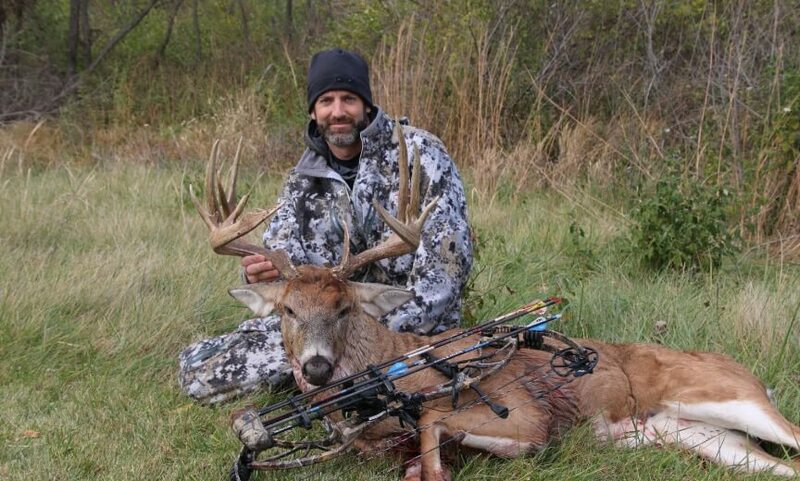 He circled around and put himself at 15 yards under me broadside on the trail I had day dreamed of him walking down many times. Without looking up or checking, I trusted Rick had his part under control. I came to full draw when he hit 17 yards and closing and when he hit the opening at 15yds I let him have it. 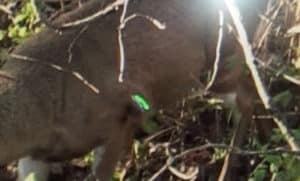 The instant feeling I had seeing that green-lighted nock hit him right where it counts, is only known by hunters alike, and I’m not sure can be described with words. If it were a common occurrence it may be different, but the pressure that is built up after a year, sometimes many years of planning, and preparing, and waiting, to the point you feel crazy and question what you’re doing, to have it all come together in an instant is a very profound experience. I’ve been in that moment many times in my life, and can say more times than not it hasn’t gone quite right. So as I watched Elvis run off like he had been hit by lighting, even though I felt it was a great shot, something deep down in me questioned every part of it. An instant voice in my head was saying what if. Watching him eventually walk out of sight, the doubt started creeping in even more, maybe because I had just watched Rick’s deer go down within sight. Maybe because I’ve had similar hits before where it didn’t work out. Maybe, because it all just seemed too good to be true? Rick re assured me that it was a good fatal hit and that calmed the voices at least momentarily. After all, we had it on film, and could go back to get a good idea of what to expect before taking up the trail. There are a few people I always text right away, when something good has happened out in the woods. That day my first text went to my dad, merely telling him I had just shot the biggest buck of my life. Being my dad and the guy who taught me most of what I know responded with a simple “good hit? Where you at?” We made a plan to meet up an hour later and look at the video to put together a plan if needed. After a few more texts to friends, I finally let Rick climb down out of the tree to go check out his buck. We took our time and let it all soak in as we left his deer there and quietly made our way out of the woods back to the truck. An hour or so later we met and looked over the video to find the shot was a little low but still good in every ones opinion. With confidence out weighing my doubt, we went back to where the shot took place. Within 20 yards we had found the arrow intact with blood nearly all the way to the fletching’s. The 4 blade muzzy was also in tact but had a few bent blades. From there the blood trail was decent but not great, it lead us almost 300 yds before we could hear what sounded like Elvis struggling to walk yet staying ahead of us on the trail. This is a scenario every hunter faces at some point, as bad as you want to keep after it, you know the best thing to do is back out. After a good 10 minutes of arguing with myself about it, we backed out, and made the decision to wait for morning. I spent the rest of the night contemplating the situation and how I hoped or thought it would play out the next day, all along wondering where he was and what he was doing that exact moment. The next morning, Saturday the 14th, myself, my oldest son who had just turned 12, Rick, and my dad all met and made a plan. My son and I would take up the trail, while they posted up on the other side of the small section where we would inevitably end up in case we jumped him and pushed him. Which is exactly what happened. I couldn’t believe he was still alive. He was badly hurt, and didn’t have the energy to haul out of there like most wounded deer would. He slowly made his way through trying to escape but with no real urgency. When he came out on the other side he went by my dad at 40 yards. The first shot went right over his back, As he then picked up some speed and headed out into the open bean field the second shot missed also as he ran off. By this time I also had come out on the other side only to watch him disappear over the bare hillside. I made my way to the top of the hill as fast as I could in hopes of seeing where he would go to bed up next. As I crested the horizon there was a CRP ditch below me and at the far end of that the next timbered draw. As I stood there glassing, he must have gotten nervous because he was there, bedded just below me the whole time. He finally got up and ran into the next draw. I was sure he would bed down quickly as he didn’t seem to be able to go much more than a couple hundred yards at a time before having to lie down. Again I had to make the call to back out and give him some more time. We gave him another 5 hours and went back in after him around 1pm. This time we ran the same plan, only this time my dad and I would follow up the blood trail into the draw. Rick and my son would post up on the far end. Once again we ran him out the far end only this time giving Rick a running shot at 40yds. Another miss and all we could do was watch him head out of site again, only this time heading for big timber and an area I did not want to see him end up in. Instead of giving him more time, I decided to follow up his trail right away to at least ensure I’d have a good idea of where he would be the next morning. I sent Rick and my son to the far end of the section just in case he actually made it that far, and my dad and I again picked up the trail. After a slow pain staking 300 yards or so of following a blood trail that was getting lighter and lighter, we finally caught up to him. We watched him struggle to cross the creek that we were paralleling. Once he made it across he got into a standing cornfield only a couple rows in and laid down again. I told my dad if I sneaked up the creek bank a hundred yards, and he went down the creek bank a hundred yards and walked the corn to me I would probably get a shot. If not it would at least push him into a small area that I would feel confident in leaving him for another night. The plan worked as Elvis got up and trotted down the cornrows right at me. What I didn’t plan on was not only having to find him in my peep running through the corn 5 rows in, but to somehow get an arrow through it as well. This would be the second time having him at full draw but not being able to shoot. He exited the cornfield not far away and did what he was supposed to do by going into the small section ahead where he was limited on where he could go while remaining in cover. 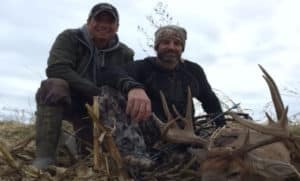 I met up with my dad at the end of the cornrows only to see another hunter climbing out of his stand not far from where Elvis had just passed by. As the hunter walked towards us, I had a few different scenarios running through my head on what was about to happen. Would he be outraged, over ruining his evening hunt? Or think this was his deer like many hunters seem to think? Would he be jealous we were on the trail of an awesome animal? I had a lot of things running through my head, most of which were negative, so when he got to us with a smile on his face and the first words out of his mouth being “man he’s a giant, he went right passed me and I know where he went, we’ll get him” I was pleasantly surprised. Looking back I guess it still could have gone either way, but it’s nice to know there are still guys out there that are happy for others success and willing to help out anyway they can. We spoke for a while only to find out we had mutual friends and acquaintances (small world) and made a plan to all meet back up yet again in the morning. This was beginning to be the saga of Elvis instead of the harvest of Elvis. By that night we had tracked him over 2 miles, and missed 3 shots at him. Meeting up Sunday morning, I was confident not only that we would get him, but that we would find him expired in his bed. Just in case, I sent Rick and my son to the far end to post up like previously. As myself, and now the new guy picked up the trail. Not too far into it I got a text saying “we got him” As I frantically text back to see if that meant they actually had him in their hands or if it just meant they saw him, I looked up from crashing in the distance only to see Elvis once again on the move and heading back across the creek from being shot at and missed once again by Rick. Being very frustrated, and to the point of badly wanting it to end, I quickly headed towards the creek myself in hopes of sneaking down it to cut him off and get a shot. When I got to where I thought he should be, instead of seeing Elvis I saw Rick up on the hill trying to give me hand signals as he was watching it all play out. Once our communications were squared away, I had the direction and approximate distance of where Elvis was. I made my way out of the creek bed and into an open meadow only to find myself at a fence and no Elvis. Little did I know Elvis was merely 10 feet away, Yes 10 feet. Tucked down in a patch of multi flower rose like a rabbit. As he jumped out of his bed and ran up the hill, I could only shake my head as he was still getting the best of me. At this point, I knew the odds were in our favor, He was drained of energy, he was taking bigger and bigger chances letting us get closer and closer. We just had to stay on him, but be controlled in how we pursued him. I put together a plan for my dad and I to stand post this time and have the other three slowly push him to us. The ditch he was in gave us the advantage of knowing almost exactly where and what he would do. As I waited for about 20 minutes I rehearsed in my head how it was going to end when he came out at any moment. As rehearsed he showed up walking down the trail I knew he would right at me. When he got to 30 yards I came to full draw, and right before the shot he laid down behind some brush. Knowing the guys wouldn’t be too far behind and would get him up again, I stayed at full draw looking for a clear shot. After what seemed like forever he got up, I let the arrow go only to watch it hit every tree limb possible between me and him. This sent him down the trail past my dad, who got another shot only to miss once again. “Really!” Was the only thing I could say. Elvis circled back around behind the pushers and all I could do was shake my head in near defeat. I mean how many chances does a person get? This was now 6 missed shots. I gathered the troop one last time and asked they do the exact same push. Only this time instead of having Elvis come walking out I got a text from Rick telling me where he was and that he was watching Elvis bedded at 70 yards. I text him back and let him know I was on my way. When I arrived, I got a visual on him and began a very slow and quiet sneak to about 30 yards. It took me some time, but I finally found a hole to shoot through. I didn’t have my range finder, and when I pulled back to full draw, for some reason I bypassed my sites and just went to instinctive shooting which is what I grew up on. I took a deep breath and touched it off. I watched my arrow hit him far back but he was quartering hard away so it was a well-placed arrow. He jumped up and ran off out of the ditch into a picked cornfield. I slowly followed him, watching him trot a hundred yards to lie down just for a moment. Only to get up and trot another hundred yards and lye down again. This time next to a small grass strip running through the field. Once again determined to end things there and then, I sneaked out into the field getting to what I thought was about 50 yards. I knocked another arrow, which held my last sharp broad head, took a deep breath to try an calm my nerves, and again took another instinctive shot. This time I hit him perfect. A double lung shot. He jumped up and ran off pumping blood out both sides. Even with 3 lethal shots in him, he continued to walk off like he was tougher than anything I could throw at him. I watched him get to the bottom of the grass strip where he reached a small ditch that if he were willing, would lead him to the biggest thickest nastiest section around. I watched in amazement as he was refusing to go down. I hollered at Rick as he was coming up the hill that I was out of arrows and needed one from him. He finally reached me, handed me an arrow, and just shook his head as to say what a deer, what a day, and what a story. I knocked the arrow as I began my walk down the slew, knowing he wouldn’t put up much of a fight at that point. I knew he was done; it was just a matter of time. However after all the fight, all the determination to live, all of the struggle over the previous two days I felt compelled to put him down and end the abuse. 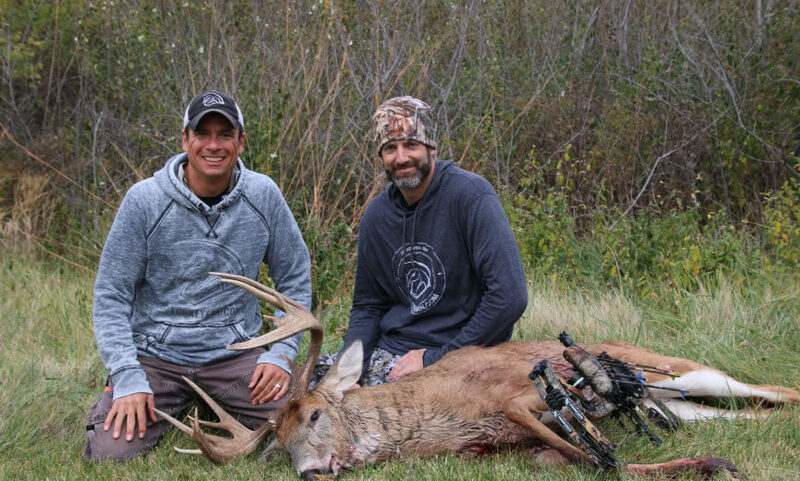 As I walked up to within 50 yards of him, he just stood there, with his head half down, worn out, not wanting to give up, but his body not letting him go any further, I was able to put one more well placed arrow in him to put him to bed for the final time. There’s a lot of emotion involved when killing an animal. It’s not something I take lightly nor do I ever take for granted. This animal however taught me more in 9 days than I had learned in most my life of chasing whitetails. Not just in techniques of hunting, but also in the deep emotional connection I personally have with wildlife and the outdoors itself. Walking up to an animal like that after such an endeavor is something that’s not likely to repeat very often. So with much respect I will cherish that moment and share the story for as long as I’m able. You can bet, next time I find myself chasing a particular animal, I’ll always remember back to Elvis and what he taught me along the way. In this Epic chase for one of my biggest whitetails to date. There was a lot of talk and speculation over that first shot, and what, if any did it hit. Everyone always has their opinions of iffy questionable shots. On how long to let the animal lie down and expire. On whether or not its a fatal hit or not etc. Well this is one instance we were able to go back and see what actually happened. In the picture below you can see where my muzzy broad head grazed the heart. A shot I believed to be fatal with in seconds and put a whitetail down with in yards. Instead he lived for another 3 days and traveled nearly 3 more miles. Food for thought next time your tracking an animal with a questionable shot.